A Joomla! 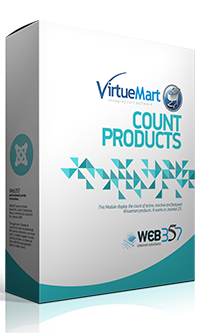 module that displays the count of active, inactive, or featured products of Virtuemart. Text can be added before and after the counted number. # Minor bug fixes and many improvements. # Bug fixed after upgrade to J! 3.7.3. The admins can't enter text in the form fields from the plugin parameters. # Web357 framework has been updated to the version 1.4.5. + Compatibility for auto-updates via Watchful.li external service. [Many thanks to Valentin Barbu, Rafael Gaus, and Frank]. + Compatible with the latest version of Web357 Framework v1.4.3. ^ If the JED link does not exist yet, do not display the 'leave a review' text inside the plugin parameters. + Compatible with the latest version of VirtueMart 3.0.14. # Bug Fixed: error Deprecated: Non-static method mod_vmcountproductsHelper::getActiveProducts() should not be called statically. # Bug Fixed: error Deprecated: Non-static method mod_vmcountproductsHelper::getInactiveProducts() should not be called statically. # Bug Fixed: error Deprecated: Non-static method mod_vmcountproductsHelper::getSpecialProducts() should not be called statically. + Compatible with "Web357Framework" (joomla! system plugin). ^ Improvement design for parameter fields (better radio buttons and color pickers). + ADMIN: New Element: Description of extension (buttons: view demo, more details, changelog, support). + ADMIN: New Element: Version Check. + ADMIN: New Element: About Web357 (logo, description, find us on social media). # Clean and code improvement. + You can link the for count of products in the module parameters. + You can add html in text fields in the module parameters. Mostly for security and compatibility reasons, you should always have the latest version. Our support team will always be there for you, providing answers to all questions within 24 hours. A vast assortment of major and minor features, to make customization easy and your site alluring. All our code is clean, organized and commented. We are following the Joomla coding standards. We go above and beyond basic language support to make Web357 extensions flexible and adaptable. Before & After text (You can insert HTML text in front or at the end of count). Virtuemart's Link (Enter the link to the Virtuemart). Type of Products (Count the Active, Inactive or Featured products).